WILD ABOUT HARRY: W.C. Fields and "Friend Harry"
Here's a little addendum to our Margery Week. This is a photograph of Houdini and comedy great W.C. Fields taken during a chance meeting in front of the Copley Plaza Hotel in Boston on August 27, 1924. Houdini was in a particularly good mood as he had just succeeded in detecting the methods used by "Margery the Medium" the day before. This was the reason for his stay in the city. 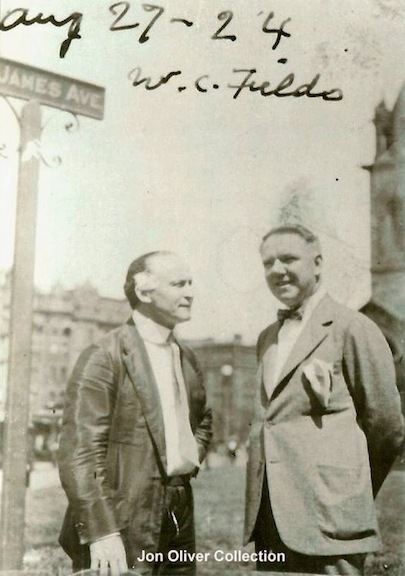 Houdini and Fields knew each other from their Vaudeville days. The photo was snapped by Houdini's assistant, Jim Collins. Field's said he was glad to see "Friend Harry" again "and find you looking so well and happy." Houdini and W.C. Fields now enjoy an eternal connection at The Magic Castle in Hollywood. Fields' original trick billiards table sits in the Inner Circle across from the Castle's new Houdini aquarium. A Houdini bust also sits above the "W.C. Fields Bar." Fields info from Houdini!!! The Career of Ehrich Weiss by Kenneth Silverman (page 340). Photo from the Jon Oliver Collection. You can almost hear W.C. telling Harry in this photo: "Better here than in Philly." What a shiny jacket Harry has on! They did not have synthetics in those days. Mohair or leather or what? Not Satin! The Only Building in the World Devoted to Houdini. Reminds me of that nice Italian silk suit Al Pacino wore in the opening scenes of The Godfather II. Houdini was a bit sloppy in dress at times but I don't think the clothes he wore were cheap quality. I've replaced the scan from the Henning book with a much better image from the collection of Jon Oliver.